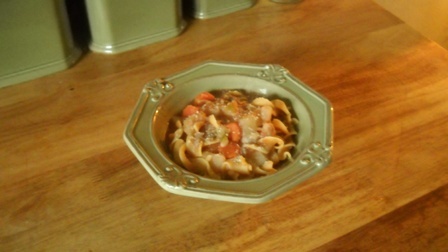 I have been making this stew ever since my children were very young. It is savory and delicious, and it is quite healthy. One time, I remember having relatives over one day for supper, and I served this with crackers. Their young children wouldn’t even taste it. They were used to consuming pretty, processed foods and eating at fast food restaurants. I had to make them peanut butter sandwiches instead! Sad. My own children still enjoy it very much. For us, it is a staple dinner that is both healthy and delicious. I hope you enjoy it as much as we do! 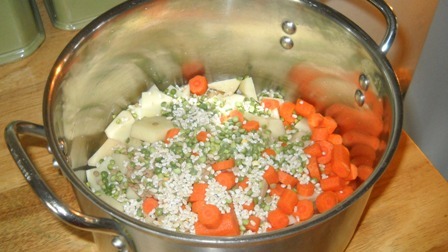 Put all ingredients into a large soup pan. Cover this with 7 cups of water. Bring to a boil. Stir occasionally for 30 minutes. Bring back to a boil. Stir and cook for about 2 minutes. Next, add 1/2 bag of wide egg noodles to the pan. Bring back to a boil. Then cook on medium, stirring occasionally for 10 minutes. Serve topped with a little Parmesan cheese (optional). That was kind of you to stop and make an unplanned meal for your young guests. What are parents today thinking? Children will grow into teens and young adults who need to know how to eat at homes of friends (even if just for a sleepover), at family, at social, and at business meals, and they need manners and social skills to do that. Aside from allergies and medical necessities (diabetes, etc. ), there seems little reason to refuse to taste a dish. love it!!!!! Thank you so much for great recipes that are affordable. Trying to think what I would use to replace the barly for gluten free folks. I know I can use some Quinoa noodles. Any ideas? I like that this uses barley, lentils, and split peas. I linked to this in my December meal plan.